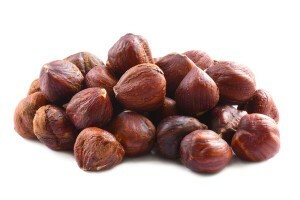 Hazelnuts are also known as Filberts. They are easily visually recognizable due to their unique shape. The hazelnut is one of Europe’s oldest cultivated plants. The hazelnut tree originated in Turkey and today, Turkey remains the largest producer of hazelnuts. 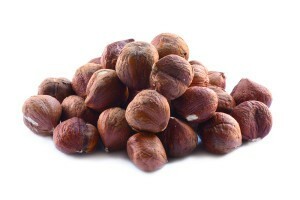 Other areas that commercially produce hazelnuts are Italy and South Western British Columbia Canada. In the United States, hazelnuts are grown commercially in Oregon and Washington. Hazelnuts are harvest in autumn when the nuts fall naturally from the trees. Commercial growers use mechanical devices called a sweeper, a harvester, a nut cart and a forklift to collect the hazelnuts. The sweeper moves the fallen nuts to the center of the rows. The harvester separates the nuts from the leaves and twigs. The nut cart is used to hold the nuts that the harvester picked up. A forklift brings a tote so that the nuts can be offloaded from the cart into the tote. It then stacks the totes which are ready to be shipped to the processor where the nuts are dried. Depending on the quantity of nuts, the harvesting process is done from 1 to 3 times per season. Hazelnuts are a good source of magnesium. Magnesium helps support muscle health by regulating calcium levels. A reduction in muscle spasms, cramps and fatigue can be attributed to having a sufficient amount of magnesium in your body. Magnesium also helps support bone and joint health. Eating hazelnuts is an excellent way to prevent osteoporosis. Sun exposure can accelerate the aging process for your skin. Hazelnuts contain vitamin E which research shows protects the skin from harmful ultraviolet radiation. It also protects against premature aging. By making hazelnuts a part of your diet, you are gaining protection from various types of cancer. Hazelnuts are a good source of vitamin B6 which assists amino acids in protecting the nervous system. 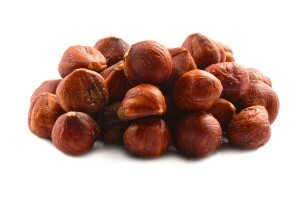 The high fiber content of hazelnuts aids in digestive health and supports colon health. Hazelnuts are a natural source of vitamin B. This vitamin is attributed with assisting in weight loss and in weight maintenance. The monounsaturated fatty acids in hazelnuts help prevent coronary artery disease and reduce the risk of stroke. Hazelnuts are rich in monounsaturated fatty acids such as oleic acid which helps lower LDL or bad cholesterol levels and raise HDL, which is the good cholesterol. .They are also a good source of beneficial linoleum acid. Hazelnuts are an excellent source of magnesium. Your body needs magnesium to regulate calcium levels in your muscles. If your calcium level is too high, your heart may beat irregularly. Getting a sufficient amount of magnesium is beneficial to your heart in that it keeps the heart from overexerting itself. Studies show that vitamin E plays a significant role in reducing the risk of heart disease. A 30g serving of hazelnuts will provide you with 45% of your daily recommended allowance of vitamin E.
No one wants to fall victim to age-related cognitive decline. Taking steps to boost your brain and improve your memory is as easy as choosing foods that help support your brain. Purchasing bulk hazelnuts to include in your diet is an excellent way to be proactive in boosting memory and protecting your cognitive health. Just as vitamin E can promote heart health, it can also help protect against age-related cognitive decline. Hazelnuts are one of the most concentrated sources of vitamin E. In addition to their vitaminE content, hazelnuts also contain essential fatty acids, folate, fiber, zinc, potassium, magnesium and selenium, all of which support brain health. Hazelnuts earn a spot on the list of ten best foods to help prevent a decline in memory. They can also help improve your mental alertness. Those two benefits alone should motivate you to find creative ways to include them in your diet, or to at least regularly enjoy them as a snack. When you’re on a diet and find hazelnuts for sale, you don’t have to deprive yourself of enjoying this unique nut. Just glancing at the calories and fat content of a serving of hazelnuts is somewhat misleading if you are looking for a snack that fits into a weight loss plan. When you look at the overall vitamin, mineral and principle recommended daily allowance percentages of hazelnuts you’ll get a different perspective on the overall weight loss benefits of hazelnuts. Eaten in moderation and at specific times, hazelnuts can be helpful in fighting the battle against obesity. Hazelnuts are a high fiber food. Eating ½ ounce or approximately 10 hazelnuts a couple of hours before a meal will cause you to feel full at mealtime and therefore, eat less during the meal. Choosing hazelnuts for a snack can reduce your hunger for a longer period of time than if you choose a less fiber-rich food. Studies show that eating nuts stimulate the metabolism which is a positive factor for anyone trying to lose weight.